Set includes terminals for engines with early type (socket) and late type (HEI “spark plug top”) distributor caps. Multi-angle boots and terminals factory installed on one end. Routing spark plug wires is an art form. It takes patience and time to route your wires away from the headers, through separators and to the distributor cap. Some wire sets fit perfect, but a lot of people want to build their own so they can route them exactly how they see fit. Our Universal spark plug wire sets come with the spark plug terminal and boot installed with the other end open. 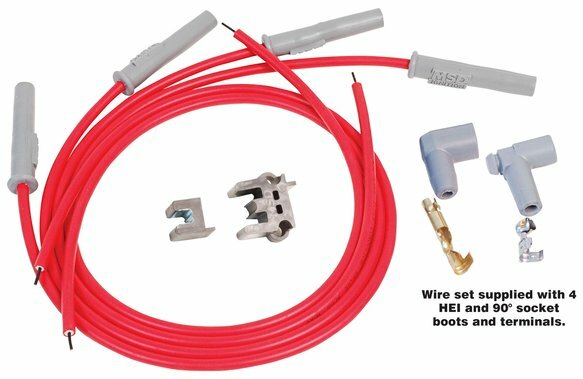 Distributor cap boots and terminals are included so you can cut the wire to the desired length, then install the terminal with the supplied Mini-Stripper-Crimper. It's a little more work, but in the end it will be worth it.